Even better, there are so many options with stir-fried food, every day can be a ‘what can I cook’ day but no one else will know it wasn’t carefully planned in advance! This little beefy beauty will appeal to you carnivores; but as the meat is so lean and only one tablespoonful of oil is used, it’s not a scary waist-expander. Serve with noodles or rice of your choice. Check cooking instructions and times before you start frying the beef and carrots; it’s annoying when the main dish is ready before the accompaniment! Prepare the beef by trimming any fat from it and cut it into thin strips. If you have half an hour to spare before your hungry mob are ready to eat, first marinade the beef in a bowl with the juice and rind of the orange. If you have only ten minutes, then marinade the beef for that long. It really does make a difference to the flavour, so is well worth waiting a little while if you can. Next, drain the marinade juice into another container and leave it until later. 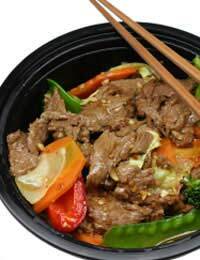 With the beef still in your bowl, add the soy sauce, cornflour and ginger. Make sure these ingredients are well mixed with the meat. Heat the oil in your wok, skillet or heavy-based frying pan, over a fairly high heat. Add the beef and fry for about 60 seconds-enough to seal and colour the meat. Turn down the heat and add the carrot strips. Your final ingredients are the salad onions. Stir them in and add the fresh orange juice liquid reserved earlier from your marinade. (If you did not use a marinade, simply add the orange juice and grated rind now.) At this stage you could add a tablespoonful of rice wine vinegar or dry sherry if you fancy. If you want to make the meal go a little further add some water chestnuts to bulk it up a little more! Cans of these prepared vegetables are useful to have in the store cupboard when you’re going through a stir-fry phase - especially if you have kids whose friends tend to ‘drop in’ at meal times! Keep stirring your pan contents as the liquid heats up. Bring to the boil and once the sauce has thickened up nicely - with a lovely orange glaze to it - your main dish is ready to serve. Noodles or rice are all that’s needed to complete this tasty simple supper.